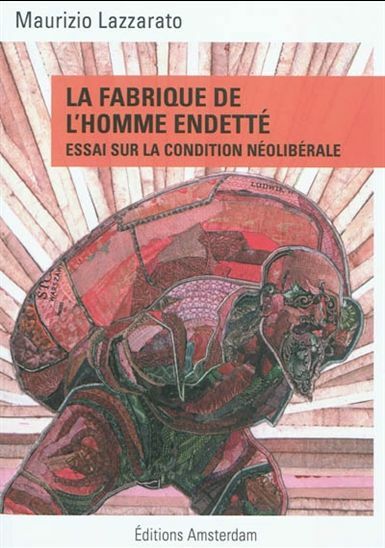 Maurizio Lazzarato’s new book La fabrique de l’homme endetté is another fabulous, lucid and inspiring account from the Italian philosopher. The short book is, as the subtitle promises, an essay on the “neoliberal condition”, which in this case encompasses an analysis of debt. It could not be timelier. This is an obvious statement but the importance of debt from the macroeconomic level of public sector national crises in Europe and US to the microeconomic subjectivity of the individual agents cannot be overestimated. Indeed, what Lazzarato offers is a philosophico-historical analysis of the debt condition via Nietzsche, Marx, Deleuze & Guattari and Foucault. Written in an accessible style, Lazzarato’s argument is easily summarized. What grounds the economic relation is not exchange as so often assumed in classical economic theories but the credit-debt relationship. This, in other words, is a relation of asymmetric power, which is the fundamental starting point for what is followed up by economic and political contexts (two tightly related fields, argues Lazzarato distinguishing himself from Badiou and Rancière’s argument concerning the autonomy of the political from the economic). Debt as a feature of neoliberalist policies affecting exactly the diminishment of the public sector gradually from the 1970s onwards is what Lazzarato insists as a better way to understand contemporary capitalism than talk of financial capitalism. With the creditor-debt relation he is able to talk of the subjectification process inside capitalism. Lazzarato proceeds in a clear fashion, first taking aboard Nietzsche’s genealogy of morality and explication the debt relation as one of guilt. The relation of debt is one of morality and hence encompasses the social relation before establishing the economic. The precondition for debt is that you are able to make promises, project to the future, and establish a relation of future promises made now. This temporality is a significant feature in terms of how debt attaches to the morality, the embodied subject of capitalism that Lazzarato insists is not only cognitive. Indeed, in more than one passage he argues that the theses concerning cognitive capitalism are insufficient to understand the whole relation. The investment in the cognitive, and the cognitive as the motor of contemporary production is just one modality in a wider context. Indeed, later he goes on to elaborate what he calls a more “existentialist” mode of subjectivity at the centre of this neoliberal condition. Yet, this is not Sartrean existentialism, but one that comes from William James. The cognitive is only a small part of subjectivity that more fundamentally includes more intimate things – passions, impulsions, beliefs and desires. Hence, in this mix of Nietzsche-James one is looking at more non-cognitive forces that relate to a relation to future. This futurity is something that in various different ways has been suggested as a way to understand contemporary powers of security-capital, from pre-emption (Elmer and Opel), premediation (Grusin) and futur antérieur (Massumi). For Lazzarato, this is an articulation of belief and the necessary incertitude as its atmospheric context, which is all embedded in the wider culture of risk that we find from the discourses of entrepreneurship to work in general. Hence, Nietzschean genealogy of bodily feelings (or lets call them affect, even if Lazzarato does not really talk of affects) is one that lends itself to understand what is the social enabling the capital relation. When bringing in Marx to his analysis, Lazzarato refers to a much less known text, “Credit and Bank” (1844). This is what Lazzarato calls the Nietzschean Marx; one who sees the condition of debt entirely attached to the subjectivity of the poor, the one who is on borrowed time (hence, applies to the rent relation as well…). Here, to paraphrase Lazzarato (p.45), the credit does not characterize only labour, but the wider work that goes into the self – instead of just investing into physical or intellectual capacities, credit/debt is something that attaches to the morality (the future-orientedness) of the subjectivity, and hence is a question of ethics. To continue with Lazzarato’s explication of Marx, this relates to a total alienation as it touches not only a specific part of the worker’s time (that of work) but the whole ethics of being as someone who is promising, bearing risks, and assuming a future. What is captured is the future-prospect, or something that Lazzarato calls as the debt-relations’ asphyxiation of futures. Throw in Deleuze and Guattari for good measure. Obviously, so much of Lazzarato’s analyses has been already implicitly about Deleuze-Guattarian emphases that he explicates in the book. The “non-economic interpretation of economy” that DG’s emphasis of the production of the social brings in is again the point of asymmetry of power. As a certain anthropology of capital, it allows us to think, again, not exchange but debt/guilt/power as what enables the economy. The two monies of a) revenue/salary and b) capital need to be distinguished. The latter is what governs financial capitalism as a form of futurity (or pre-emption of futures) where the credit money is able to what kind of productions and products will actualize (and of course, one could add, it is not only about such but the constant deferral of the virtual money repackaged into new forms of debts – subprime). To paraphrase Lazzarato (p.71), the approach he proposes is about the transversality of the debt/neoliberal condition. Employed, and unemployed, productive or unproductive, the state of debt runs through economic, political and social fields (ibid.). Picking up on Foucault’s points (and updating some others), Lazzarato reminds that the (neo)liberal condition is not about reduction of control and governing, as so often rhetorically claimed, but about emphasizing certain patterns of contradiction, accumulation of value and power, and minimizing the democratic possibilities of intervention (120). For me, Lazzarato’s brilliant extended essay/book raises questions; for instance, how to elaborate the debt as embodied; Ie. what could be called, for the lack of a better word, “affective capitalism”, where the affect bit refers to the bodily and often non-cognitive states and excitations; of desires and impulsions; whether in the brain or in the gut. Could this be connected to the wider interest in brain sciences in the context of digital culture (interface design)? And the wider discourse of the brain – brain sciences in contemporary culture? Could there be a mediatic way of continuing Lazzarato’s analyses, to connect the future-oriented subjectivity to analyses of the media technological condition of the human in contemporary neoliberalism? Hey this looks awesome! I’ve got an article that should be out early next year that examines ‘loyalty’ as a relation between affect and futurity in the context of capitalism in the way you describe. Loyalty cards, loyalty programs etc. I use ‘Up in the Air’ as an example. It is a D&G/whitehead reading/appropriation of futurity in Derrida’s Marx book and of particular interest is the affective dimension of appetition. Hi Glen – can’t wait to read that! Give me a heads up when it’s out please.